When planning a Mardi Gras gathering, there are a few essential items that will guarantee your guests have a memorable time. Carnival is all about excess, decadence, and abandon – so it makes sense that food serves a central role. Traditional Southern staples are sure to please, so don’t skimp on the muffulettas, gumbo, and étouffée. 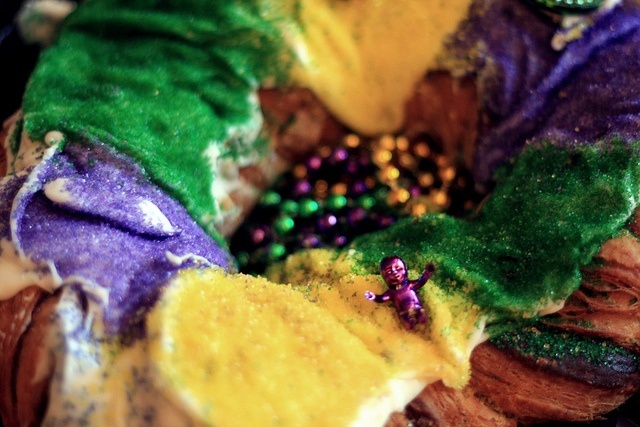 Most importantly, don’t forget the king cake! There are a variety of excellent recipes available, ranging from the usual cinnamon, apple, and cream cheese to more exotic flavors like chocolate and pear. If baking your own doesn’t appeal to you, there are a whole host of lavish pâtisseries in the city where you can procure one ready-made. Best of all, many of these places will ship your delicious treat right to your front door at minimal cost. Cake Café in the New Orleans Marigny area carries an apple-goat cheese variety that’s truly to die for, and Randazzo’s in Metairie has perfected the art of the traditional recipe with a cake that’s both suitably flaky and deliciously creamy. You may want to consider placing the plastic baby on top of the cake to avoid a choking hazard as your guests scarf down slice after slice. 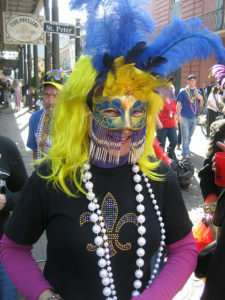 One of the most exciting parts of attending public Mardi Gras events is seeing all the incredible costumes. Folks often spend months sewing sequins and molding papier-mâché headpieces to ensure they look their finest when stepping out on the town. Your private party should be no different. Encourage attendees to dress up and consider awarding a prize for the most elaborate and outlandish creation. Classic styles like kings, queens, and court jester outfits are a good place to start, but departing from the norm isn’t just tolerated, it’s encouraged! The key is to look as dazzling and dynamic as possible, with a focus on everything feathery, sparkly, and shiny. 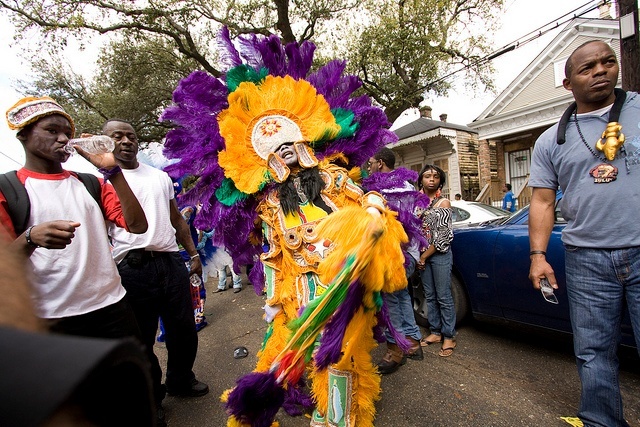 Incorporate a little purple, gold, and green into your get-up if you want to give a nod to tradition, or consider researching the history behind the flamboyant and intricately feathered Indian costumes. Remember; concealing your face is an integral part of this celebration, so whether you paint your eyes in lively colors or don a Venetian-style masquerade mask, it’s crucial that your identity remains a secret! The little ones will love getting glittery and dressing up as they dance to classic New Orleans big band music. You may not be able to fashion your own gigantic, politically satirical floats, but there are plenty of other fun things you can plan to really get your carnival party popping. If your guests haven’t brought their own masks, adults and children alike will enjoy cutting, pasting, coloring, and otherwise adorning their own customized face wear. You could even put together a prize pack for the best design, containing traditional throws like beads and doubloons. 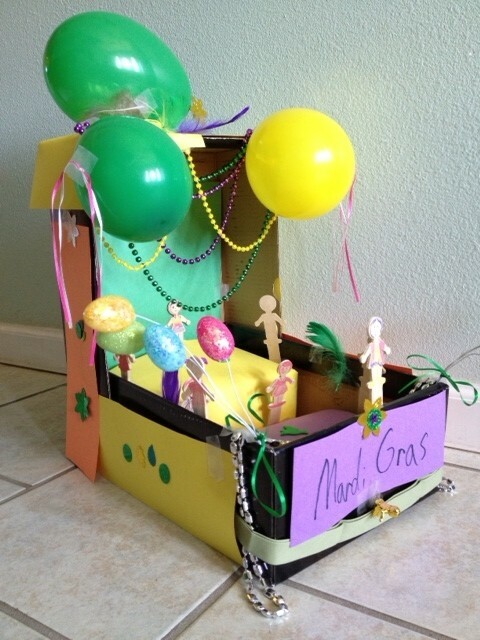 Shoebox floats are a creative, compact way to get an interactive parade experience at home; take a discarded shoebox (or any small cardboard container) and dress it up with paints, colored paper, and other craft supplies. Older children may want to get crafty with more detailed designs – you could even use small strings of twinkle lights to illuminate these dioramas, making your very own miniature Endymion line-up. 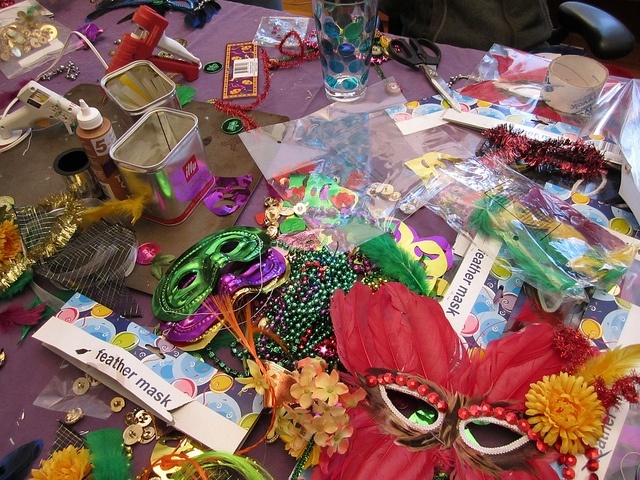 Smaller kids can still have a blast with this activity, but may also enjoy fashioning their own Mardi Gras shakers out of recycled plastic bottles. Take some paint, glitter, and rice, and combine them for a musical accessory that the little ones can shake at the passing parade floats. Or perhaps they will enjoy stringing together their own Mardi Gras candy necklaces with twizzler pieces in place of beads. However you celebrate this season, have a joyous and wonderful time!